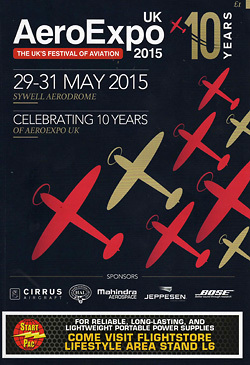 Sywell Aerodrome hosted the 10th AeroExpo UK at the end of May alongside HeliExpo. The event dubbed “The UK’s Festival of Aviation” is aimed to promote and support civilian aviation with a large ground exhibition from aircraft and equipment manufacturers, various different aviation traders plus many of the supporting organisations. Adding to the main event this year was HeliExpo opening the event to rotary-wing aircraft which are becoming increasingly popular thanks to the advent more affordable machinery. Sywell Aerodrome, one of the country’s best general aviation hubs, is home to AeroExpo UK which regularly attracts 12,000 visitors. It offers the opportunity for general aviation stakeholders to try, buy and even fly the latest products from the general aviation sector. As well as the trade fair there is a large programme of seminars exploring a wide range of aviation topics from safety to the latest developments in aviation technology. There could not be many better venues for such an event than Sywell. Its hangar complex becomes the main exhibition area and the co-located Aviator Hotel is superb venue for the all-important networking opportunities during the after-show events. Such events attract like-minded people from across Europe and therefore alongside the trade fair there is an amazing fly-in which sees Sywell’s sky filled for much of the day. Visitors come from fair and wide and this in turn proves a great attraction to some enthusiast, most notably those who collect registrations! Like the much grander Aerospace Events like Farnborough, a number of aircraft manufacturers had their own exhibition areas with their aircraft on view to visitors. Well-known names such as Cessna, Beechcraft, Piper and Pilatus were joined by some less well known manufacturers such as EuroFox and Stemme showing off their last machinery. Alongside the main AeroExpo show was the HeliExpo exhibition for all things rotary. With the resurgence of Gyroplanes, the Rotary sector is growing in the General Aviation market. One of the big names at the show was Bell Helicopters showing off their latest Bell Model 429. HeliExpo also brought it with some flying action with the HeliExpo Championships. Those who were visiting airshows in the mid-1990’s may remember TV personality Noel Edmonds ran “HeliFest” Events which were often incorporated in larger airshows such as the Biggin Hill International Air Fair or the Cranfield Airshow. Part of those events was a competition which pitted celebrities against each other trying to guide a weight on a rope through an obstacle course guiding the pilot to manoeuvre the aircraft. Well, the HeliExpo competition ran along similar lines, through with professional teams from around Europe and some much more dramatic flying using Robinson R22s and R44s. Each day saw a short airshow with many of the display items being related to the exhibitors on the ground. Saturday’s show started with the amazing little E-Go. Powered by Hybrid Technology, the aim of the E-Go’s manufacturers is to build an affordable, safe and fun aircraft. Displaying the E-Go was Test and Shuttleworth Display pilot Keith Dennison who really showed off the full envelope of performance. In complete contrast was Rich Goodwin’s incredible aerobatic display in his Pitts S2S Special. Rich has continued to modify his Pitts and this year it featured a bigger more powerful rudder and a spectacular new and very patriotic colour scheme. Rich has nicknamed his aircraft “The Muscle Biplane” and he certainly exploits the incredible power of his aircraft with all manner of gyroscopic tumbles, flicks and even hovering the aircraft on its prop. The TRIG Aerobatic Team provided more Pitts action with their classic Pitts S-1D Specials. Richard Grace and Dave Puleston fly a tremendous routine of close formation and synchronised aerobatics in their wonderful looking aircraft. It is unusual for UK events to welcome solo aerobatic acts from Europe. However, audio specialists Bose brought over from the Netherlands the Sukhoi Su-26MX flown by Frank van Houten. Frank’s Sukhoi wears a very distinctive orange scheme and it certainly had presence in the sky over many of the more modern aerobatic machinery. Adding a rotary dimension for HeliExpo was Peter Troy-Davies in his Rotorport Calidus. Peter’s displays the Autogyro as close as regulations allow him to the crowd and that combines with the use of smoke makes for a highly engaging display that was certainly appreciated by the AeroExpo crowds. The chosen charity supported by AeroExpo for 2015 was Aerobility. Based at Blackbushe Airfield in Hampshire, the charity offers those with disabilities the opportunity to go flying and go on to attain private pilots licences. They have their flight simulator and a small fleet of their own aircraft plus other specialist equipment. One of the display teams associated with the charity is Guy Westgate’s GliderFX Display Team. Guy has recently had his MDM-1 Fox Glider overhauled and refinished with an eye-catching vinyl wrap highlighting Aerobility and sponsored Haywards Aviation Insurance and Advance LED Solutions. Providing the aerotow on this occasion was a EuroFox which is proving to be a popular new type for Glider Clubs being cheaper and easier to operate. Despite the different machinery, Guy was still able to perform his trademark low-level “Roll-on-Tow” before climbing to height for his aerobatic solo. On the Saturday, Guy also displayed the Stemme S10 self-launching sailplane. A brand new German design, the S10 is a beautiful and innovative piece of engineering. Most self-launching sailplanes have a retractable motor on a pylon behind the cockpit. However, the Stemme has the motor recessed within the fuselage and a propshaft running to a retractable propeller in the nose. To operate the motor, the nose cone is extended and the spin of the motor forces the propellors to unfold. While the motor is operating, various vents open on the fuselage side and the Stemme flies much like a normal powered aircraft. For gliding, with motor is switch off, the propeller and nose retracts as do all the vents creating a very streamlined and graceful soaring glider. With delicate smoke-trails from the wingtips, the Stemme with its large wingspan was an impressive sight as it performed some sweep wingovers to close the air display. AeroExpo and HeliExpo is a superb shop window on the General Aviation world and a fascinating day out. The large ground exhibition and informative seminar programme was supported by some great action in the air from Helicopter competition and the short, but very sweet flying display. If you are interested in getting into flying then this really is the event for you.